The Coast Range Episode is named after the Coast Range Mountains of British Columbia. The episode began 115 million years ago when a second chain of volcanic islands collided with the western shoreline of the Pacific Northwest. These islands welded to the edge of the continent by molten rocks that cooled to form the Coast Range “Batholith”—the largest single body of granitic rocks in America. The islands that approached the shores of North America in Mid-Cretaceous time are called the Insular Volcanic Islands. Like the Intermontane Islands before them, the Insular Islands were an active volcanic arc occupying the far end of a microplate. In this case, the Insular Islands rode along a fragment of the Farallon Plate we call the Insular Microplate. That fragment subducted underneath the continent, and its molten rock was rising upward to create the Omenica Arc. The larger Farallon Plate to the west was in turn subducting beneath the Insular Plate. As the Farallon Plate subducted it began to melt. The molten rock rose through the Insular Plate to feed the active volcanoes within the Insular Islands. The Insular Volcanic Islands approach the Northwest coast. The volcanic islands were riding atop the Insular Plate, but the molten rock feeding the volcanoes came from melting of the Farallon Plate. When the Insular Islands collided with the Methow Shelf 115 million years ago, the Insular subduction zone feeding the old Omineca Arc shut down completely. The Insular Islands were a composite of several volcanic chains. The island chains were already very ancient before they collided with the Northwest. They started forming in early Paleozoic time and probably came together offshore by the Carboniferous Period some 300 - 325 million years ago. The southern end of the Insular Volcanic Islands in British Columbia and Washington included two prominent groups of islands known as the Wrangell and Chilliwack Groups. The Wrangell Group is named after the Wrangell Mountains in southern Alaska. The Chilliwack Group is named after the city of Chilliwack in British Columbia. The Wrangell and Chilliwack Islands were separated from the continent by an ocean basin we call the Bridge River Ocean. We are uncertain exactly when the Insular Islands first arrived at our shores. Some evidence suggests they persisted as an offshore volcanic chain for some time, much like the islands of Japan do today. In any event, the final collision between the islands and the continent, and the final closure of the Bridge River Ocean, did not occur until mid-Cretaceous time, perhaps 115 million years ago. This collision marks the beginning of the Coast Range Episode. Like the earlier accretion of the Intermontane Belt, the collision of the Insular Islands with the edge of the continent was a dramatic affair. The rocks of the Intermontane Belt along the old continental margin were once again crushed by compression, folding and fracturing. In the Insular Belt itself, and particularly in the remaining fragments of the Bridge River Ocean, deformation was even more extensive. As in the accretion of the Intermontane Belt 60 million years before, these rocks were crushed, folded and stacked together to form a thick “welt” along the new edge of the continent. As the Insular Volcanic Islands collided with the Pacific Northwest, the old subduction zone of the Insular Plate jammed and shut down entirely. The descending Farallon Plate took over as the active subduction zone. As molten rock from the Farallon Plate rose upward through the accreted Insular Belt, the Coast Range Arc intruded molten granitic rocks to form the Coast Range Mountains from Washington to Alaska. Like the Intermontane Islands 60 million years before, the Insular Islands were simply too massive to subduct beneath the continent. The Islands jammed and shut down the subduction zone feeding the Omineca Arc. In its place, the pre-existing Farallon trench took over as the major subduction zone. The Insular Belt today makes up the western coast of Canada, including Vancouver Island. In Washington, rocks of the Insular Belt are known as the Chilliwack Terrane north of the Skagit River. In the eastern half of the North Cascades, the Insular belt is largely preserved by rocks that formed on the floor of the Bridge River Ocean. The “suture” between the newly accreted Insular Belt and the old continental margin (the Methow Shelf) is a major northwest-trending fault through the North Cascades named the Ross Lake Fault. Many geologists believe the Wallowa Mountains in northeastern Oregon are also a displaced fragment of the Insular Belt. Molten rock ascending from the Farallon Plate under the newly accreted edge of the continent gave rise to a new volcanic arc along the coast known as the Coast Range Arc. It was among the largest continental volcanic arcs in the world, extending from Washington to Southeast Alaska. Plutons of hot magma burned their way upward through the newly accreted Insular Belt, injecting vast quantities of granite into rocks of the old Insular Islands. At the surface, new volcanoes built along the margin of the continent. The volcanoes of the Coast Range Episode have long-since fallen to erosion. What remains today are the granitic “plutonic” rocks, which intruded and cooled at depth beneath the old volcanoes. In a belt extending north from Snoqualmie Pass in Washington to Southeast Alaska, the rocks of the Coast Range Arc are known as a batholith – an enormous body of granitic rocks that cooled deep beneath the Earth’s surface. The Coast Range batholith is the largest such body of granitic rocks in North America. The intrusion of these molten granitic rocks welded the newly accreted Insular Belt to the rest of the continent. 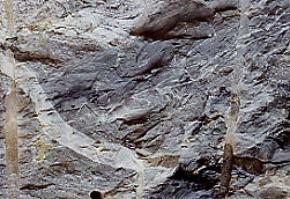 Many of the older plutons in this episode were subsequently deformed under the heat and pressure of later intrusions, turning them into a layered metamorphic rock called “gneiss”. In some places, mixtures of older plutonic rocks and the original oceanic rocks have been deformed under great heat and pressure to form exotic swirled patterns called “migmatites”, appearing to have been nearly melted in the process. The spectacular migmatites of the Chelan and Skagit regions in Washington are world-renown in geologic circles. Swirled patterns of migmatite, Chelan, Washington. Height of outcrop is 6 feet. The vertical tubes are “blast tubes” from highway construction. Whatever the case, when the Farallon Plate split it created two distinct oceanic plates separated by a new oceanic spreading center. The portion of the plate north of the spreading center was the “Kula Plate,” after a native American word meaning “all gone.” The Kula Plate originally extended from offshore California to the Aleutian Islands in Alaska. The Kula Plate continued to subduct underneath the Pacific Northwest, supporting the Coast Range Arc. The Farallon Plate ruptured between 80 and 90 million years ago, forming a new spreading center off the west coast of North America. The part of the old Farallon Plate north of the spreading center was the Kula Plate. Even after the rupture, the Kula Plate continued its subduction beneath the Pacific Northwest. The new oceanic spreading ridge slowly migrated northward toward the Pacific Northwest. The new spreading ridge between the Kula and Farallon plates intersected the coast of North America in what is now northern California. In its early stages of development, the spreading ridge broke off pieces of offshore California. These rocks of the ocean floor were sheared off and transported north along the edge of the continent. In the process, they were thoroughly fragmented, shattered and crushed into a disorganized jumble of rocks. Geologists call this chaotic rock complex a “melange.” Melange is a French culinary word meaning “mixture.” It aptly describes the chaotic jumble of rocks within the Melange Belts of Washington. Mt. Shuksan, Washington from Picture Lake. The chaotic rocks of Mt. 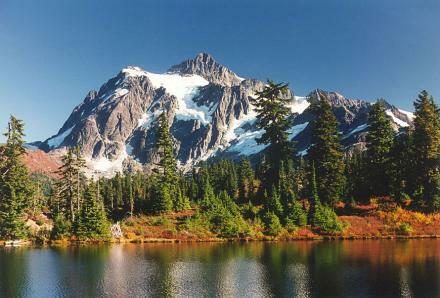 Shuksan are typical of the fragmented, disorganized rocks of the Melange Belts. These rocks were originally sheared off from offshore California and transported north to Washington along the edge of the continent. Photo by Wade B. Clark. To the north, the accreted Intermontane and Insular Belts had created a large embayment in the continental margin, and presented a south-facing coastline in the path of this northward-migrating melange complex. The melange probably arrived here in more than one package. The earliest arrival was probably about 85 million years ago. Sketch map of the Columbia Embayment south of the Melange Belts. The end of the Coast Range Arc resulted from the changing geometry of the Kula Plate, which progressively developed a more northerly movement along the edge of the continent. By 60 million years ago, the movement of the Kula Plate apparently became parallel with the western margin of the continent, and subduction ceased. The boundary between the Kula Plate and the Pacific Northwest became a transform plate boundary. Instead of subducting beneath the continent, the Kula Plate began sliding northward toward Alaska. With the end of subduction and the development of a transform margin, the Coast Range Episode ended. This change in plate dynamics heralded the dawn of the next chapter in the evolution of the Pacific Northwest: The Challis Episode.